A 38-year old mother found she had a mutation in her thyroid nodules before it turned into cancer with Swagene’s innovative diagnostics. Hypothyroidism, characterized by high TSH (thyroid stimulating hormone) levels, is widely prevalent across the world and strikes more women than men. One of the most common causes for hypothyroidism and thyroid nodules is Hashimoto’s thyroiditis or Hashimoto’s disease, which is an autoimmune condition. Research almost unanimously agrees on the high risk of thyroid nodules, especially Hashimoto’s thyroiditis developing into thyroid cancer, and that increased surveillance of these patients is of utmost importance. Thyroid nodules are frequent in the population and affect 50-60% of people over 50 years’ age. These have a high risk of developing into papillary thyroid carcinoma (PTC), which is the type seen in 70–80% of all thyroid cancers. A 38-year old mother, a highly active woman being a dancer, runner and practicing yoga occasionally, never faced weight gain, but was extremely tired to the extent of having difficulty getting out of bed every morning. She was diagnosed with high TSH levels, hypothyroidism, and was given thyroxine medication. Upon ultrasound, she was found to have multiple nodules <1 cm in size, and the FNAB (fine needle aspirate biopsy) pathology result came out as colloid goiter. Nothing out of the ordinary! That is, until the FNAB sample was tested in our lab. We found her sample had the HRAS mutation, which is prevalent in Thyroid cancer, and is only tested at Swagene in all of South Asia. The good news is that HRAS mutation being present in precancer stage, she did not have cancer, but has a high risk of progression to cancer. Moreover, this is a mutation that shows mostly slow progression to cancer, meaning she can live cancer-free with clinical management because of detecting it at such an early stage. If you ever undergo ultrasound-guided FNAB of thyroid nodules, get them tested – call us at +91 44 4201 4700. 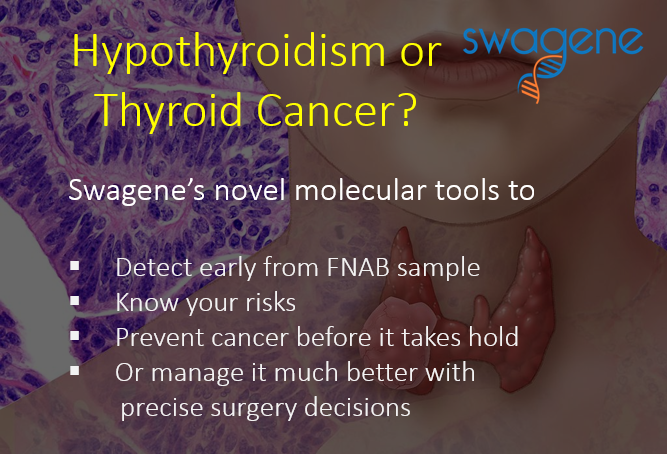 Swagene is currently the only lab to do thyroid cancer-specific mutation markers by molecular diagnosis. While we do not advocate it as a screening test, if FNAB has been done, send the sample to our lab for rapid testing for very early diagnosis. With cancer, the earlier the diagnosis, the higher the treatment success. With thyroid cancer, early diagnosis can prevent or remove it altogether! Mutations tested in thyroid cancer include the genes BRAF, NRAS, HRAS and KRAS. We’re soon adding TERT promoter mutation also to this panel, as it has a highly unfavourable prognosis similar to BRAF mutation, and can even coexist with BRAF mutation leading to compounded risk.